In the days following the release of video showing McDonald’s fatal shooting, McCarthy maintained that Emanuel supported him and said "I've never quit anything in my life"
Chicago Police Supt. Garry McCarthy was fired Tuesday, exactly one week after dash-cam video showing the fatal shooting of 17-year-old Laquan McDonald was released. Chicago Mayor Rahm Emanuel said he has asked McCarthy to step down from his position, saying the "trust and the leadership of the department has been shaken and eroded." "Now is the time for fresh eyes and new leadership to confront the challenges the department and our community and our city are facing as we go forward," Emanuel said. He added that McCarthy "had become an issue, rather than dealing with the issue." 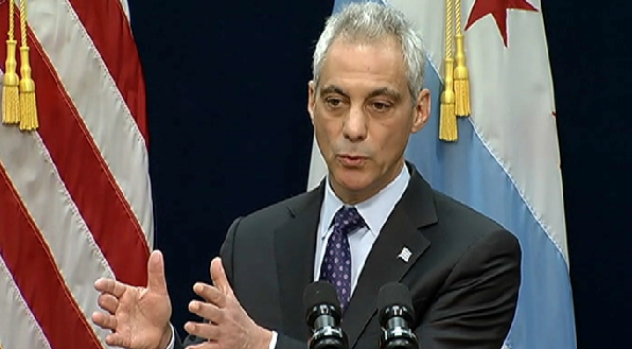 Chicago Mayor Rahm Emanuel said he asked for the resignation of the Chicago Police Supt. Garry McCarthy. John Escalante has been named acting commissioner "until the police board has conducted a thorough search." "I have a lot of loyalty to what [McCarthy has] done and him, but I have a bigger loyalty to the city of Chicago's future and the strength of that future and no one person trumps my commitment and my responsibility to the city of Chicago and its future," Emanuel said. Emanuel and McCarthy have faced mounting criticism over the handling of the Laquan McDonald case, with many citing the 13 months it took to charge the officer involved and others questioning McCarthy’s leadership and credibility. McCarthy has also been criticized for the handling of another police-involved shooting that killed Rekia Boyd, a 22-year-old unarmed woman. He revealed last week that he agreed to move to terminate the officer involved in that shooting "after a comprehensive review of the investigation,” but the move comes nearly three years after the incident. In the days following the release of video showing McDonald’s fatal shooting, McCarthy maintained that Emanuel supported him and said "I've never quit anything in my life." "I'm 56 years old," McCarthy said. "I don't expect that to change. What I will tell you is the mayor has made it very clear. He has my back." McCarthy appeared on NBC Chicago Tuesday morning where he admitted that the initial press release on McDonald’s shooting was “mistaken” but added that there was little he could do once a federal investigation was launched. “I didn’t have the authority to do what people thought I should do in this case, by law,” he said. U.S. Senate candidate Andrea Zopp, who is the former president and CEO of the Chicago Urban League issued a statement Monday demanding McCarthy resign and asking for a special prosecutor in the case of Jason Van Dyke, the officer charged with shooting McDonald 16 times. Last week, the City Council's Black Caucus convened for a press conference to publicly demand McCarthy's resignation for the second time in just a few months. Cook County Board President Toni Preckwinkle also voiced her opinion that McCarthy should resign, saying she called Emanuel Friday morning to tell him she was joining members of the City Council who want McCarthy out. Emanuel and Cook County State’s Attorney Anita Alvarez have also received heat from other politicians and activists for their roles in holding off on releasing the dash-cam video to the public and filing charges against Van Dyke. Van Dyke was charged with first-degree murder in the October 2014 shooting last week. Dash-cam video of the shooting shows an officer shooting the teen several times as he appeared to walk away from police. The footage has sparked protests throughout the city and prompted an increase in calls for McCarthy to step down. Some have said that McCarthy's firing isn't enough. "It does very little if you change the head and you don't change the heart and infrastructure," said Rev. Jesse Jackson. "That's not enough." Emanuel also addressed that concern during the Tuesday press conference. "This is not the end of the problem, but it is the beginning of a solution to the problem," he said.